Tomorrow is the summer solstice, and with the longest day comes the shortest fiction. National Flash Fiction Day celebrates the power of the briefest form of fiction, with events across the UK. In my home town of Bristol, there will be a free flash fiction workshop takes place from 1.30-4.30pm at the Central Library. I went along last year and found it a great source of inspiration. In fact, one of the pieces I wrote at it, since titled Eternal Sequential, will be published by Farther Stars Than These on Thursday 26 June 2014 – how’s that for timing? 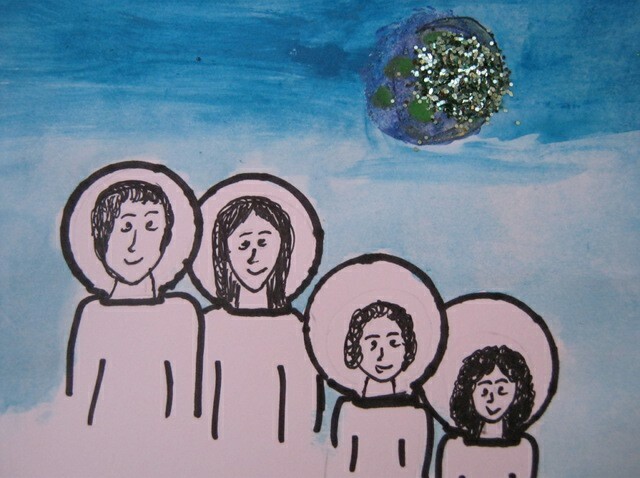 The piece was prompted by a postcard showing a family wearing spacesuits, and the letter E plucked from a sack of Scrabble tiles (yay, I got a vowel!). I didn’t get to keep the postcard – hence the fact I produced the piece of artwork at the top of this post in its place – so if you go along to the workshop, perhaps you’ll get to write something inspired by it yourself! 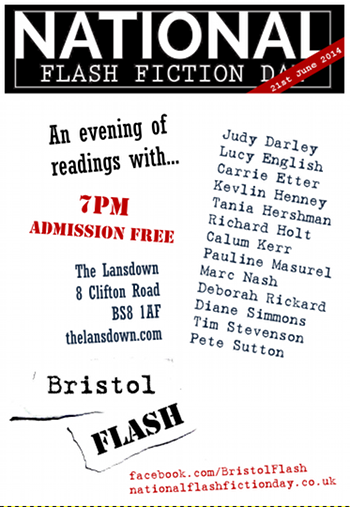 In the evening, I’ll be reading two pieces of my flash fiction as part of an evening of readings hosted by Bristol Flash upstairs at the Lansdown pub. Other writers taking part include Tania Hershman, Kevlin Henney, Lucy English and Calum Kerr – so please come along. It’s a free evening of literary entertainment, and a great alternative to the footie! This entry was posted in Judy's writing and tagged literary events, National Flash Fiction Day by Judy. Bookmark the permalink.